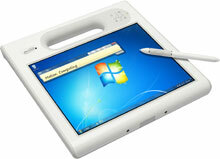 The Motion Computing C5v Mobile Clinical Assistant has been discontinued. No direct replacement is available. Deliver mobility and reliability at the point-of-care with the Motion-Computing C5v Mobile Clinical Assistant. The industry's first Mobile Clinical Assistant (MCA), the C5v Mobile Clinical Assistant was designed specifically for health care environments in partnership with Intel Health and based on input from thousands of clinicians worldwide. Lightweight, rugged and fully-sealed to ensure compliance with infection control protocols, the C5v Mobile Clinical Assistant is built for demanding health care environments. Get a handle on patient care with the Motion-Computing C5v Mobile Clinical Assistant. It's highly portable. It's lightweight. And, it's ready to work for you.